Karl Feodor Sim, alias Carl F. Goldie, spent most of his life in Foxton. He gained notoriety with his forgeries of works by Goldie and other artists. His work was good enough to deceive many art experts, but eventually he was charged and convicted. 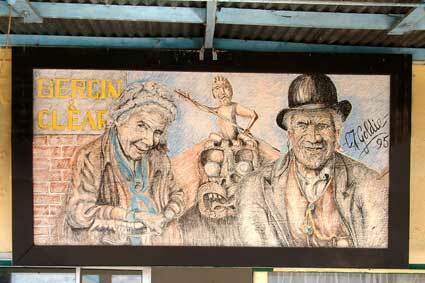 Depicted on the right hand side of this mural is a replica of the Goldie painting " A Good Joke". On the left is Agnes Brewer who was employed for over 60 years in the local solicitor's office, Moore & Bergin. In the centre is the carving on the Matakarapa Church, Te Upiri, which became derelict in the 1950's and subsequently collapsed.